Rewinding VHStival 2018! A Recap Of A Most Radical VHS-Driven Weekend! | Birth.Movies.Death. Rewinding VHStival 2018! A Recap Of A Most Radical VHS-Driven Weekend! The first-annual VHStival was a total blast. Saturday, October 20th 2018 didn’t just mark the 8th Anniversary of International Independent Video Store Day. It was also the kick-off of an absolute whirlwind of rewind-inclined revelry inside Video Vortex, the mammoth and marvelous video store inside Alamo Drafthouse Raleigh: This was the first day of VHStival 2018. Featuring two days and nights of screenings, events and a total VHS party, the first-ever VHStival officially began at 11am, starting off with a VHS swap offering an avalanche of videotapes overflowing from the tables of over a dozen vendors, slinging and swapping titles ranging from dope rarities to common classics to unheard-of obscurities with every flavor of cinema in-between. The Video Vortex lobby was incredibly alive in those opening hours, buzzin’ and rumblin’ with analog-driven excitement as fest-goers moseyed from table to table digging deep through stacks and tubs, sifting through thousands of tapes in total. Helping to lubricate conversation among the collectors was a beer especially created for VHStival 2018, aptly called Head Cleaner, brewed by Raleigh, NC local Trophy Brewing. It flowed freely into fest-goers gullets from groovy-looking cans as early as the event started, proving that when you team up with a local brewery to birth a new beer specifically for an event, it’s totally okay to drink it for breakfast. And the best thing? It’ll be available in Video Vortex until the limited edition runs out, dude. We also had a radical VHS repair station set-up and run by Skip Elsheimer of A/V Geeks.Tapeheads brought in their moldy tapes for cleaning, and Skip helped fix everything from broken top hinges, to complete reel transfers. We definitely helped save some special tapes for peeps over this weekend. And that rules. The first show of the fest began at 2pm, and what better film to get things VHStarted than Gary P. Cohen’s seminal shot-on-video horror Video Violence? Gary P. Cohen was there in VHSpirit via video introduction where he talked about the heyday of VHS, and how incredible it is that Video Vortex, a real live video store, can exist in this capacity in 2018, and encouraged everyone to enjoy the incredible experience. It was a joy just to have his voice echo through the seats at the opening of his screening. After the first feature, it was time to get radical with the VISIONS OF VHS gameshow. We picked two contestants from the crowd, showed them three really weird VHS clips, and asked them specific questions about each clip. Bewildered they were for sure, but it was a total blast. Plus, the winner got a groovy prize (a Lunchmeat Home Video Horrors 2019 calendar)! Then, from the quintessential video store horror flick, to the undeniable cult smash sci-fi that centers around a video store, the second screening of the day featured Remote Control – with director Jeff Lieberman (who also helmed classics like Just Before Dawn, Blue Sunshine and Squirm) live and in-person! Stand By for Tape Back-Up was next, and was perhaps the most powerful piece of the day, and quite possibly the whole fest. Writer/video artist Ross Sutherland traveled all the way from the UK to envelop us in his intriguing and undeniably emotional performance piece fueled by a VHS from his past. It didn’t just tell his story; it connected everyone who revisits VHS for comfort or some sort of important reminder. You can call it “nostalgia”, and you wouldn’t be wrong. But it made me (and the audience) really ruminate on how and why we watch these tapes, and what it really means to us. It was tremendous, and Ross was pure class. 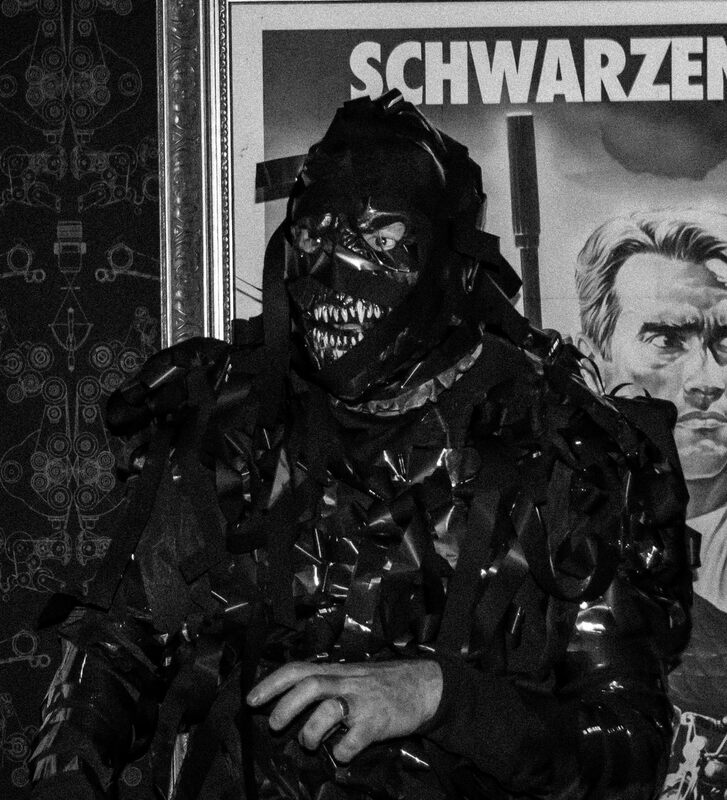 I think this is about the time THE TAPE MONSTER was let loose upon the crowd. Yes, there was a TAPE MONSTER, and he was terrorizing everyone in VHSight! This ruled. Day one of VHStival rounded out with what is arguably the most authentic piece of video-era throwback filmmaking ever made: WNUF Halloween Special. The vibe of this film is just pure fun with an axe slam of unexpected horror to finish off the “broadcast”, and it really felt like the perfect piece to punctuate the first day of the festival. 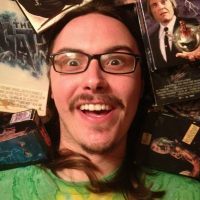 WNUF fully and fantastically captures the essence of VHS, both in aesthetic and feel, and the vibes it sent through the theater were potent and palpable. Laughs spilled forth from every fest-goer throughout the film, and the Q&A after the feature with director Chris LaMartina was insightful and inspiring. Chris explained in detail how he and his crew got that insanely authentic look to the film, and when a young girl asked if he had any advice for budding filmmakers, his advice was simply brilliant: make content, never stop and thank those around you. That all gave way to the announcement that Chris LaMartina wants to bring WNUF back for a continuation. Trust me: after you see the first one, you’ll crave the second one like candy from someone else’s bucket, and you can help jolt that project to life here. VHStival day two kicked off with another radical tape swap, featuring some new faces in the vendor spaces of course bringing a new extension of VHS selection. The first screening of the second day was a never-before-seen director’s cut of the sci-fi, experimental freak out SPLIT (1989). Not a single person in that theater had seen this movie before, and to me, that was the point of this screening. After the feature, people left with mouths agape and eyes wide, in apparent awe of what they just saw. When I introduced the film, I told them that this is the kind of movie that needs to be seen more than once to be fully soaked-in and understood. It’s just that kind of movie. The next screening of the night was the most personal and potent for me as a producer on the project: Adjust Your Tracking: The Untold Story of the VHS Collector. This was the five-year anniversary of its release, and to be able to look back with a crowd and hear their reactions, it was truly something special. 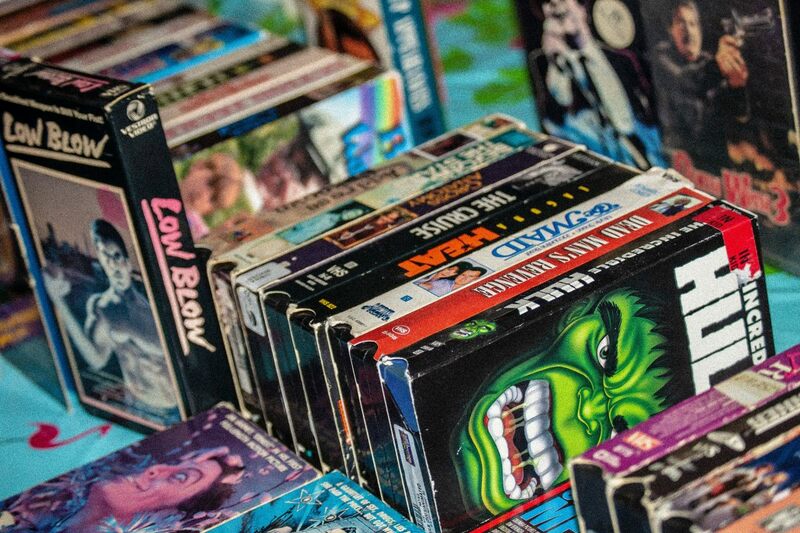 Lots of laughs were had while watching, and hopefully, for those who hadn’t seen it, some valuable insight was absorbed on why VHS collectors exist. The Q&A with myself, Dan and Zack (where we sorely missed produced Matt Desiderio – really wish he was there) explored all of the changes that have taken place in the culture from pricing to collecting inclinations to the surfacing of more female VHS collectors. After Adjust let out, it was time for the fan-favorite, sold-out show of the FOUND FOOTAGE FESTIVAL. These dudes really know how to amp up the crowd and entertain, and they did just that. They had an incredible array of clips to share, along with some radical insight on their origins, with my favorite being snips from a found footage staple called Memorial Day 2000 which is the VHS equivalent of a half-finished can of Budweiser being shot off some dude’s head with a shotgun blast. It’s that good. Undoubtedly the most crowd-engaging event of the night, home video hats off to the FFF for doing what they do and bringing the rewind ruckus. 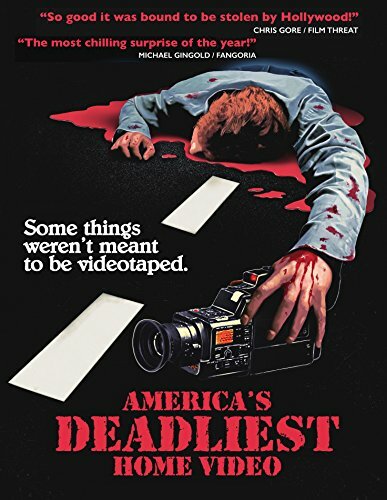 The last show of the fest was an incredible culmination - a screening of the obscure but inarguably original found footage shocker America’s Deadliest Home Video with director Jack Perez in-person. There’s one important thing happening here with ADHV, besides the actual film, of course: it’s that finding this movie on a rickety flea market table, falling in love with it and being able to share it with so many people… it’s an essential reason why I (and so many other people) continue to collect VHS. These tapes, these movies, they have a way of connecting like minds, both in a collector sense, and in an appreciation for film. And that’s what this fest was all about. It’s about the connection of a passionate community of people, and continuing to celebrate the incredible pieces of entertainment that are inherently based within the existence of VHS. And with this dedication to celebration, we continue the expansion of the culture. In closing, I want to take this opportunity to thank each and every person, artist, director, and colleague that that was a part of this inaugural year of VHStival. To have the opportunity to create a fest like this and bring together fans of VHS both old and new, it’s an indescribable pleasure and honor. This culture is amazingly vibrant, fun, ever-expanding, and most importantly, extremely alive. And I can’t wait to throw this party again next year in the name of VHS. We hope to VHSee you there. It’s going to the next most radical rewind-inclined weekend of all-dang-time! Josh Schafer is the Editor-in-Chief and Head Videovore at Lunchmeat Magazine and LunchmeatVHS.com. He loves weird movies, Mexican food, and everything groovy. VHS is Happiness.